Our editorial team now has all the flagships from the first half of 2017, so it’s time for a blind camera test. We've got some really fantastic phone cameras this time around as we're pitching the Samsung Galaxy S8 Plus against the likes of the Sony Xperia XZ Premium, HTC U11, LG G6, Google Pixel and iPhone 7 Plus. At the end of the day, it's your vote that counts - so which do you think is the best? To set up the test, we did the following: we took pictures with all the smartphones using the stock camera app and default settings – we only set the resolution to maximum if it wasn’t already set. To ensure comparability, we didn't touch the settings and – unless otherwise mentioned– didn't adjust the light settings or the focus either. Afterwards, we went on a walk with all the devices and took pictures of various subjects as we went along. Each time, we took three photos with each camera and selected the best for this blind test. Next, we lightly cropped the smartphone photos so that they wouldn’t give away the smartphone in question through the different focal lengths. For reference purposes, we also took a picture of every subject using a DSLR camera, which was the Canon EOS 5D Mark III with a Sigma 24-70mm 1:2.8 lens. We also selected automatic mode here. A quick note before we begin: the letters assigned to the individual shots may represent a different smartphone in each case, so images 1A and 2A might not necessarily be from the same smartphone. 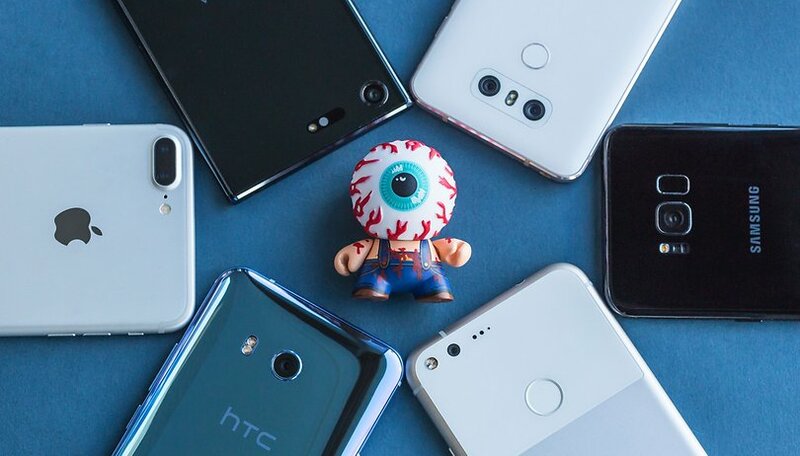 Subjects that are rich in contrast are always exceptionally challenging for smartphones: Compared to full-fledged cameras, the tiny image sensors in cell phones have a very small dynamic range. When taking pictures in back-lit conditions, for instance, it causes the foreground to be underexposed and the background to be overexposed. HDR mode counteracts this problem. Vote for the smartphone that you think did best with this high-contrast subject. Which photo is the winner for subject 1? Smartphones usually do very well in macro mode, even when directly compared to full-fledged cameras like the Canon DSLR we used for this comparison. For this subject, you can rate the detail reproduction for different devices. Since it’s essential to have the correct focus when taking close-up pictures, we tapped on the middle of the sunflower in each camera app to focus on it. Here you can vote for the smartphone you think did best in taking a close-up picture. Welches Foto ist bei Motiv 2 am besten gelungen? Several things come together in this subject: on the one hand, the contrasts from the low sun are very high but on the other hand, this subject shows a lot of detail. Thus, for the blind test, we selected a section from the photo that should cover both aspects – on the DSLR shot, we marked the area where the section can be found in the full picture. Vote for the smartphone that you think did best at dusk. Which photo is the winner for subject 3? Shots in dark settings also present smartphones’ small image sensors with a problem. To compensate for this, the camera needs to process the data from the sensor carefully and with "high sensitivity". Not doing this well will result in reading errors that appear as image noise. Here you can vote for the smartphone you think did best in taking the night shot. Which photo is the winner for subject 4? When will the results of the camera test be revealed? The results of the blind camera test will be revealed at the end of next week on AndroidPIT.com. Until then, we look forward to your votes and are excitedly anticipate the results. Thank you for participating!